If you’ve attended a WaterAfrica event in recent years you’ve had opportunity to explore the sanitation and hygiene stations built by Michael Olen in 2012. After returning from Zambia that summer, the WaterAfrica Travel Team reported how they had seen World Vision’s comprehensive Water program emphasize the importance of Sanitation and Hygiene to make sure clean water stays clean. As the Travel Team prepared their trip report that fall, Michael built models to accompany the presentation. The Handwashing Station, Dish Drying Rack, Bathing Shelter, Rubbish Pit, and Latrine were on display at Walk4Water6, along with informational posters for each sanitation station, designed by Kate Bluhm. We regularly use these stations for our Water, Sanitation & Hygiene presentations and this year we are delighted to add the final element to our display! WaterAfrica Friend Vince Tylman researched the measurements and angles of design to build us a full scale replica of a water pump for WaterAfrica to use in presentations. Vince started with plans for an India Mark II pump, converted measurements into inches, made CAD drawings for each piece, cut out the pieces (or in some cases machined them), painted them and put it all together. 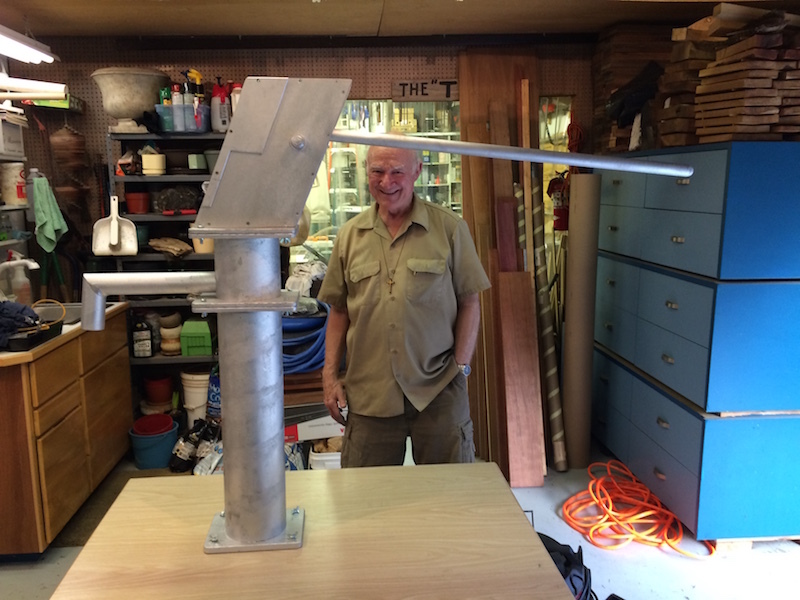 Vince Tylman with the completed water pump replica. Once complete, we put the pump to work immediately by taking it to our recent elementary school presentations where it was an instant highlight. 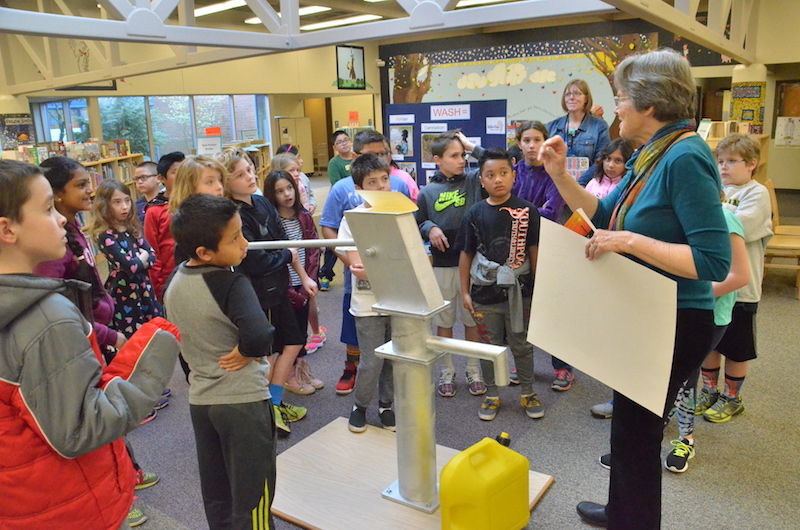 Students got to actually pump the handle and make connections to the life-changing impact of clean water in rural Africa. Students at Bridgeport Elementary at the final station in our Water, Sanitation & Hygiene presentation: Clean Water! Thank you, Vince for helping us tell the WaterAfrica story! Be sure to look for our new pump this Saturday morning in the WASH display at Walk4Water9! Share the post "New Water Pump Replica"